Fox Sports 1 saw its best ratings to date thanks to the MLB postseason last month. 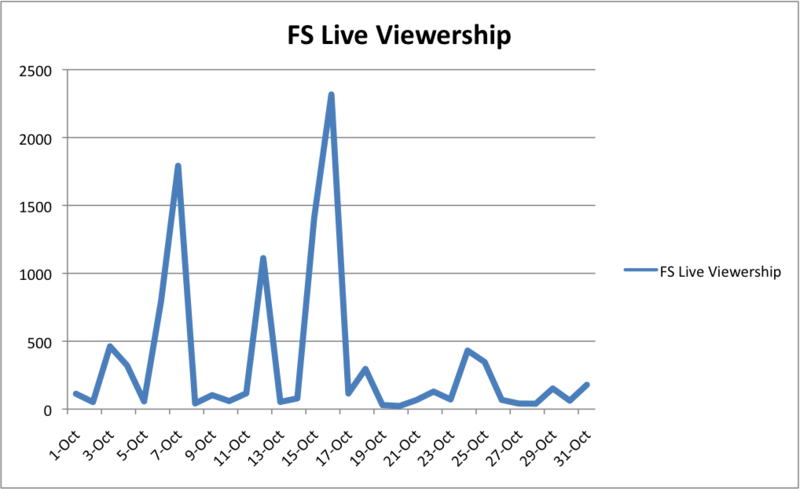 October saw the network’s most watched live events thanks to its NLCS telecasts and that carried over into FS1’s flagship program, Fox Sports Live. 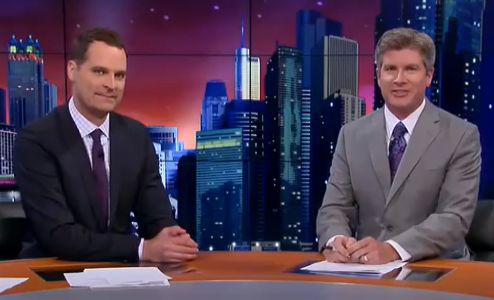 In a little over a year, the show has already been through a number of format and personnel changes around Jay Onrait, Dan O’Toole, and Charissa Thompson as it seeks to find a formula that works. Truth be told, it’s been a very up and down lifespan for Fox Sports Live in its head-to-head matchup with SportsCenter. But Rupert Murdoch and Co. has chosen to stick with Fox Sports Live as its lead studio show instead of sending it to the cutting room floor with the likes of Crowd Goes Wild, Fox Football Daily, Fox Soccer Daily, etc. The roller coaster continued in October. In fact, it went to its biggest extremes yet. Fox Sports Live saw tremendous viewership numbers thanks to MLB postseason and college football live event lead-ins. The program averaged 353,000 viewers throughout October for live first run episodes in the late evening. Impressive numbers. But a deeper dive into the numbers shows a more complex tale. In fact, Fox Sports Live is still struggling to find consistent viewership without direct live lead-in programming on Fox Sports 1. The range of viewership for Fox Sports Live is extraordinary. The program reached a max of 2.3 million after Game 5 of the NLCS on October 16th. Just 4 days later on October 20th, just 23,000 people watched Fox Sports Live – a decline of 99%. You can see just how dependent Fox Sports Live is on live programming in the chart below. The huge peaks represent postseason baseball. The medium-sized peaks owe their audiences to college football lead-in programming. On 4 occasions, Fox Sports Live broke 1 million viewers. On 5 occasions, the program fell below 50,000. With postseason baseball lead-in programming, Fox Sports Live averaged 1.3 million viewers in October. Without any live event lead-in programming, Fox Sports Live averaged just 75,000 viewers in October. Perhaps the most interesting statistic is discovering whether or not the promotion for Fox Sports Live during the World Series telecasts on Fox helped the ratings at all. The show got a lot of promotion during those telecasts as a de facto postgame show for the World Series. Somewhat distressingly, very few people made the trip from the Fox mothership to Fox Sports 1. On five nights where Fox Sports Live had no lead-in programming on FS1 and Fox was televising the World Series encouraging viewers to make the jump, the program averaged just 79,000 viewers. That’s a minimal impact, relatively speaking. Most importantly, it means that promotion from major events on Fox is not enough to get viewers over to Fox Sports 1. FS Live needs and depends solely upon live events on Fox Sports 1 itself to boost its viewership. The way you spin these numbers can fall one of two ways and depends on whether or not you have a positive or negative perspective of Fox Sports 1. One could look at the total viewership increases and the peaks and say that it’s good progress for the network in just their second year. One could also look at the valleys and make the case that even though viewers are sampling Fox Sports Live at great numbers, they are choosing not to return and make the switch from SportsCenter as their desired highlights show on a nightly basis. At this point, both might be true.